im a crybaby ( <3 u mel ) and a Steven universe fan. Im a huge rick and morty, Steven universe, and adventure time fan! <3 I'm back, and--- yea unicorns are frikin real my dudes. ]farting unicorn game coming soon. IM BACK GUYZ!! 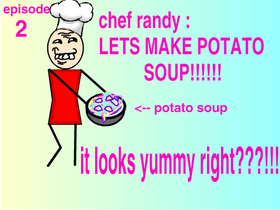 chef randy: episode 2 "LETS MAKE POTATO SOUP!!!!"